Yes, getting evidence into the record is critical. No evidence in the evidence file, nothing for the court to rule on. I would like for my evidence to be the ONLY evidence that the court has to look at, but it seems as though ‘their’ side is the only side that has no problem getting evidence admitted. When some violent incident takes place on the party of either of the party to the trial and the counsel wants to get his application on that incident, it is almost certainly rejected. How to get it admitted? What to do when you have a provisional copy and not the certified one? Information on laying the foundation for admitting scientific test results would be helpful. yes i am very interested.Thank you so much for the weekly trial tips. YES AM VERY MUCH INTERESTED IN LEARNING HOW TO GET MY EXHIBITS ADMITTED IN EVIDENCE AND HOW TO KNOCK OFF AND REJECT IRRELEVANT EVIDENCE FROM BEING TENDERED. Yes, interested. Anything that helps the tools needed for trial is always a benefit. Thanks. Yes, I’d like to second the MySpace/Facebook/Dating site stuff, I have a couple of cases where that would be helpful. Also, Florida DCF investigative findings (presumably I’d need to subpoena the investigator or records custodian, but confirmation would be nice), and a general “most frequent evidentiary issues” would be great by itself. Very Interested. Recently lost a trial because critical evidence was excluded. Need to know what I did wrong! Yes, I’m interested, and thank you for all you do in helping all of us become better advocates. I am interested. I would specifically like information on getting your exhibits authenticated, i.e. the photographer testifying that the snapshot is one he took, etc. Yes. Ditto comments from above. Yep, me too. Evidence is the one course in law school that should be a year long (at least) and isn’t. Yes to an evidence manual. Predicate questions would be most helpful. Yes, I am interested. Evidence is the basis of an entire trial; without it, trials would become nonexistent. Defenitely interested. Family Photos, business receipts and the like; these are topics of special interest for me. Thanks a million for your hints. Thanks you for all of your help hints! this is definitely something that would be worthwhile. I am currently in a trial in which the only evidence against the accused is a confession statement. the problem is the original statement was lost and they are trying to put in a copy. as a defense attorney, i am trying to make this a task for the prosecutor. maybe you could look at copies of exhibits as well. Would love this. I religiously read your trial tips newsletter. We sure are interested. Our lack of prompt response was due to the fact that we have been putting your techniques and suggestions to work battling the Allstate monster up here in Cleveland. Love the advice and the results speak for themselves. We need more! Yes, I am interested! With the advent of emails and texts, I think that would be a great section to include. And by the way, thank you so much for your great work. Elliott, It would be very helpful because the inability to lay a foundation for the admissibility of evidence is a trap for the unwary that can change the outcome of a trial. Yes, I am interested. A section on admitting e-mails would be great! Thanks. Yes I am interested! Thank you! Hi Elliott! Most definitely interested! As others have commented, past material you have offered has been very, very helpful, and I look forward to this manual. The only specifics that come to mind are some of the more complex foundational and authentication issues of modern evidence — MySpace pages, AOL emails, Facebook pictures, etc. Thanks again for an extremely informative and helpful site — keep up the great work! Yes, I am interested in such a manual. 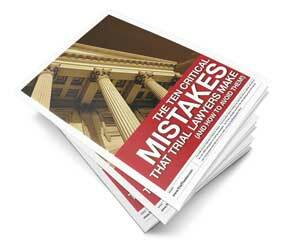 I think it could be a valuable learning tool for us young lawyers, and a referesher for even some experienced attorneys. I have observed many lawyers get bogged down or confused by the mechanics of laying proper foundations, introducing evidence, and become flustered when the Judge sustains objections to introduction. I would like to see tips on cross examining witnesses while referring to dexhibits otherwise i think the site is a great lecturer, we dont get to learn these things at my law school! biggest problem is a witness gives you very good evidence which you put down in a statement, however then on the witness stand he refuses to talk or lies… how could you try and get that orginal statemnt of the witness exhibited when the only statement that can be exhibited is that of the accused. I am interested as silence of all is YES! We are never so good that we can’t use additional help. Thank you. I’m not too worried about admissibility issues (I work for a large prosecutors office, so we’ve got lots of pre-canned predicate questions), but I’d like to tips on the best way to present evidence to the jury after it’s admitted, so that they see it, focus on the parts I want them to focus on, and remember it for deliberations. I loved the objections manual, and would definitely be interested in a manual on how to get evidence admitted. I’m still at the beginning stages of my career, so everything helps. Yes, definitely interested. Please address admitting business records (specifically, medical billing records if possible) and how to keep jurors interested when dealing with lots of paperwork.